Welcome to the website of the Early Caribbean Society. The Early Caribbean Society seeks to further the exchange of ideas and information among scholars of all nations and of various disciplines who study the literature, history, and culture of the Caribbean region from the period of the earliest written records until the era of emancipation. The Society was founded in 2002 in Colorado Springs, Colorado, by a group of scholars attending the reception hosted by the Society of Early Americanists (SEA) during the annual meeting of the American Society for Eighteenth-Century Studies (ASECS). It serves as a conduit of information among members, and it organizes panels at the meetings of ASECS, SEA, the Eastern Caribbean Cultures Conference, and other societies. 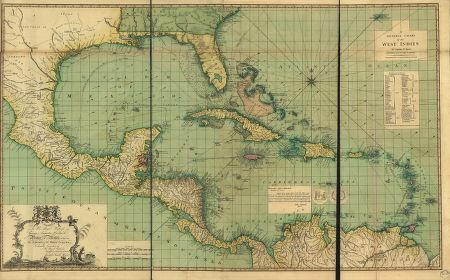 A general chart of the West Indies, 1796. By Joseph Smith Speer. Image from the Library of Congress Digital Archives.